Douglas Gardei has become our fifth guest judge and creator of this Virtual Rocket Contest. The theme for this contest is MORE POWER TO EM!. This is the moment you have been waiting for! The new "Rocksim" Hobbyshop just opened up a block from where you live, and your No Limit Platinum Card just arrived in the mail! Unlimited supply of rocket parts, and unlimited supply of rocket motors! You feel challenged to build then biggest baddest rocket of them all! Previous Rocksim contests there was a limit to how powerful the rockets can be. This contest is the first to break from that mold. Instead of limiting the Total Impulse the rocketeer can use, the materials they can us draws the line. Ie. The parts database is all you can use, you can not make custom parts (except transitions, which have to be made realistically). Cram all the power you can in a single stage rocket! Early Bird Bonus: To reduce log-jams near the contest deadline early entrants will receive bonus points, based on the time they submit a qualified design. Entries must be received by 8/15/2006. Contest will take place from 8/21 - 8/27. All designs must have an internal cargo space capable of carrying a payload measuring 3.9" in diameter and 12" long. (Fits inside a 3.9" body tube). All designs must have a mass object of 2oz for flight computer used for deployment and/or air-starts. There is no limit on airframe sizes. Thinnest airframe can not be smaller than half the diameter of the widest airframe. (This does not apply to motor tubes). All transitions must have realistic forward and aft shoulders. There must be 3 - 8 fins. Each fin must have a semi-span and a root length equal or greater than half the diameter of the tube it is mounted to. Fins cannot be any thinner than 1/16" (0.063") and must use strong material. Parachute must be at least 0.001" thick. Maximum size: Whatever will fit into the body tube. Must deploy drogue or drogue less at apogee. Minimum altitude for main deployment is 500 ft.
Motor delays must be set to none. Rocket will use electronics for deployment. No manual modification of the .eng file. Launch lugs are OPTIONAL. We will be flying from our trusty virtual 6-foot tower. Your rockets will participate in four events and will accumulate a total score. All events will use a 6-foot (72") launch tower and your choice of motor configuration (different for each event). 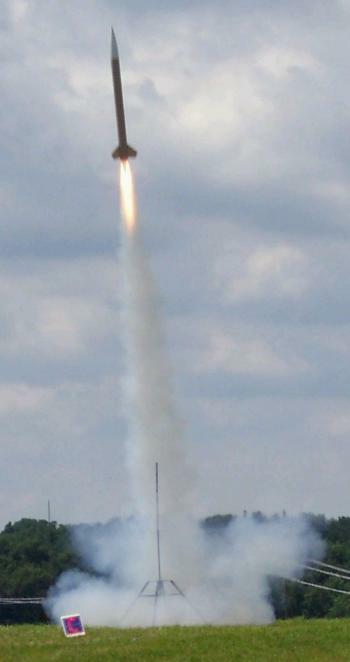 For each event, you must also choose a launch angle, no more than +/- 20 degrees. THE SKY'S THE LIMIT! : See how high you can get your beast! No payload. Must have a safe landing. IN THE NAME OF SCIENCE: You will be carrying an experimental payload for your local community college. You don't want to travel far to retrieve the rocket. So the goal is to get your rocket as high as possible, but land as possible to the launch pad. Payload is 10 lbs. Must have safe landing. Dual Deploy is allowed. ROCKETS TO THE RESCUE! : The coast guard asked to borrow your rocket! Their ship is out for repairs and they need to deliver important medial supplies to an off shore island 10,000 feet (up-wind) from the shoreline. Launching from the edge of the shore, you must safely land your rocket on an island that is 500 feet wide and nearest to the soreline without getting wet! Payload is 5 pounds. Dual Deployment is allowed. - KING OF THE GRUNT: Your are asked to launch your rocket at an airshow. However, you are asked to keep the rocket moving as slow as possible, and as low as possible so spectators can be as awestruck as possible. Looking for two things here, slowest "Safe" speed, and lowest "Safe" altitude. No payload. Must have safe landing. Flying out of bounds in event 3. Times for air starts and deployments. Main deployment altitude if using Dual Deployment. $10 Gift Certificate for something of your choice! $20 Gift Certificate for something of your choice! Don't tell anyone this, but I think Bob's is the coolest looking entry. Just look at the decals on the body and fins! This rocket would look so cool in real life. Wow! Bruce read my mind! If I was playing this contest, this is how I would of done it! Most of the power of the rocket is in the nose section, while a single 150mm motor pushes from behind. I am anxious to see how well it works out. The first entry I got, and what an entry it is! Looks like something from Junkyard Wars! Guess he needs the no limit card just for fuel! This hunk of junk gets up there on 25 motors! Another minimum diameter attempt. Sports a 98mm power plant and cool fins. Second Entry looks like Aaron is placing his chips on the last three events. Good looking rocket, a realistic one to build too. Powered by 17 motor, this sharp looking rocket with its barely attached fins reminds me of some fireworks I shot off a long time ago. Good thing I am not simulating fins snapping off. This rocket reminds me of a Scud Missile. Powered by a central 75mm surrounded by 4 98's. I like the simplicity of the design. Not only does this beast look cool, it is also powered by the largest number of motors in this contest! 29 Total! All bets are on winning the first three events it seems. Minimum Diameter, single motor power plant. Very modest approach here. I hope this rocket is called Longshot due to its length. Bob Cox gambled everything on the last two events. He knew he would not break any records with the first two which relied on pure power. His gamble worked. He was one of the two people that landed on the island, and took first place in event 4! Bruce had a early lead, but falling 6ft short of the island cost him dearly and he fell into second place. David Allen averaged in the middle, but he got first place in event 3, and because of all the wet or treed landings, he landed in third. Looks like Bruce's interesting design works well. He has a lot less power then Todd, but managed to pull ahead of him by several thousand feet. One thing I noticed with the large motor clusters is how airstarts were used. Many contestants "Revolver" fired them, one after another. Todds rocket produced almost constant trust for over half a minute! It is also interesting to note which motors were the most popular! In 150mm, the CTI O5100 (like there was any other choice? lol), 98mm was the N4800, 54mm the L1500, and 38mm the Ellis J228 showed favoritism. Probably they were the most powerful motor of that size. The two single 98mm rockets held their own with the Vizier taking 6th, and the Long Shot placing at 8th. I was curious to see if there was going be any changes with altitude placement between Event 1 and 2. There was one change! Joe Allen's single motor Vizier snuck past Bob's Goose! Bruce is doing very well. He got first place in event one, and looks like he easily landed first place in this event too! Todd is also holding second place with his beast. Aaron, Adam, and Joe are tied for third. David Allen and Bob are tied for 4th. Apparently the barrage of medical rockets launched on a day that was so foggy, that four people could not tell where the island was located. I examined the rules, and thought long and hard about whether or not I should count the landings that landed on the wrong island. Going by the rules, only one person qualified for a second chance (he did not specify + or - angle). Unfortunately, I could not do any favors for the other contestants. Everybody got three tries to land on the island. David Allen and Bob Cox were the only rockets that qualified. Bruce, who was leading in the first two events, lost his lead when his rocket fell only 6ft short of the shoreline! So close... sorry Bruce. Bob Cox really did his homework with this event. Not only did he get the slowest velocity for the event, he also got the lowest altitude! Aaron and Todd was not that far behind him, both tied for second place. Joe Allen and David Austerberry tied for third place. As expected, the large cluster rockets did not fair well with this event. Andy Peart managed 4th place, while Bruce got last place. 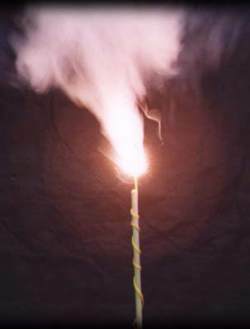 How do I simulate a Drogue-less Rocket? Simulate drogue-less by using a very small parachute diameter. The winners agree to write a kit review using the format guidelines included in EMRR's site. Previous winners are eligible for future Rocket Give-Away. EMRR assumes no responsibility for the kit once it leaves our location. EMRR is not liable for any damages or injury caused by the assembly or use of the kit.